It’s December 1st! Twenty-four more days until Christmas! Okay, twenty-three here as Christmas (Weihnacthen) in Germany is celebrated on the American Christmas Eve. As yesterday was the 1st day of Advent in Germany which heralds the beginning of the holiday season, I thought that I would post one of Eve’s and my older Christmas cards to set the mood. Every year (except last year due to home renovations) we create custom holiday cards in the form of labels that we stick on food or drink items. In 2012, we created wine labels. 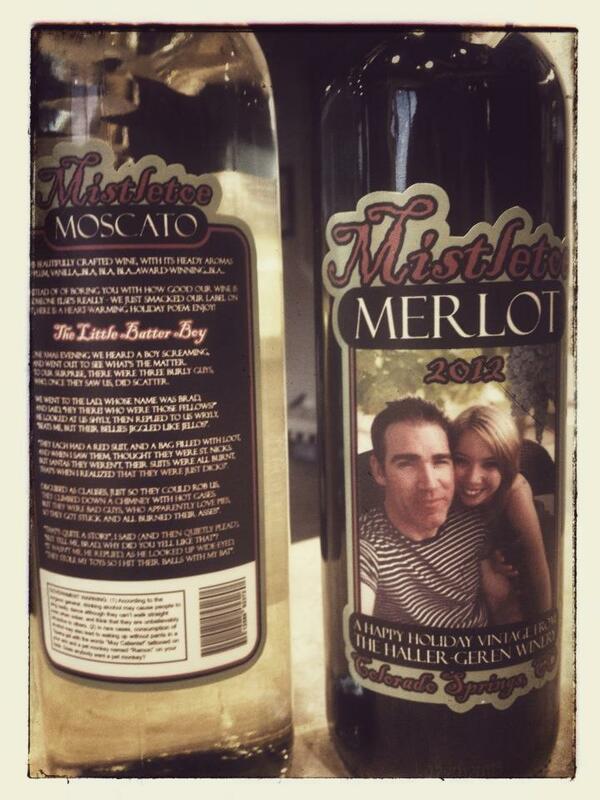 Our original label was for a “Mistletoe Merlot” but, as not everyone likes red wine (we call them “savages”), we also created a label for a white wine; “Mistletoe Moscato”. 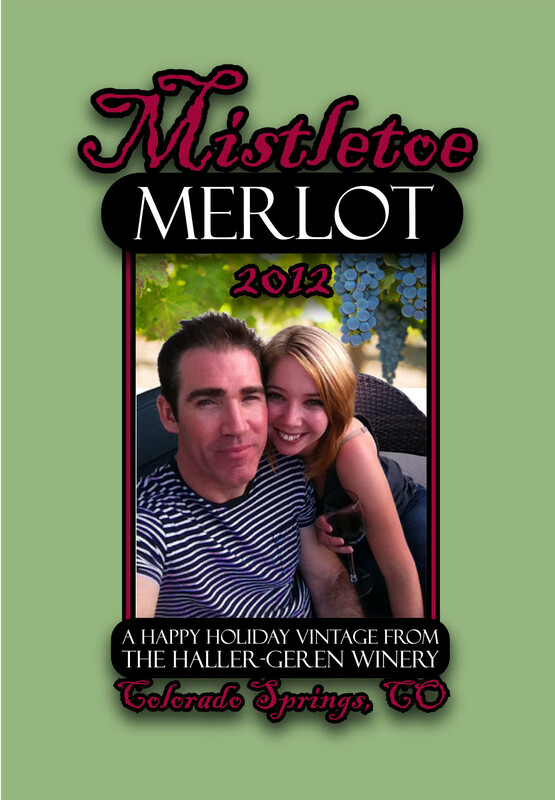 As we were then unmarried, and since Eve’s maiden name is Haller, we dubbed our brand “The Haller-Geren Winery”. For those of us that know us well and have seen our collection, this isn’t far from the truth. As it is impossible to ship alcohol in The States, we also made actual cards that we mailed out to friends and family unwise enough to not live near us. As this card was created a few months before we moved here, you might think that this particular post isn’t exactly about being an American in Germany, but you would be wrong: Eve and I brought several labels with us on our trip here for Christmas that year. After fetching several bottles from one of the local stores, we locked ourselves in the her parent’s bathroom, stripped the original labels off, and applied ours before giving them out as gifts. For most, being seen emerging from a bathroom with eight bottles of wine might prompt concerned questions which would, therefore, spoil the surprise. Since it was Eve and I, however, this apparently seemed quite normal. No one batted an eye, much less said anything, which left the surprise – if not our dignity – intact. 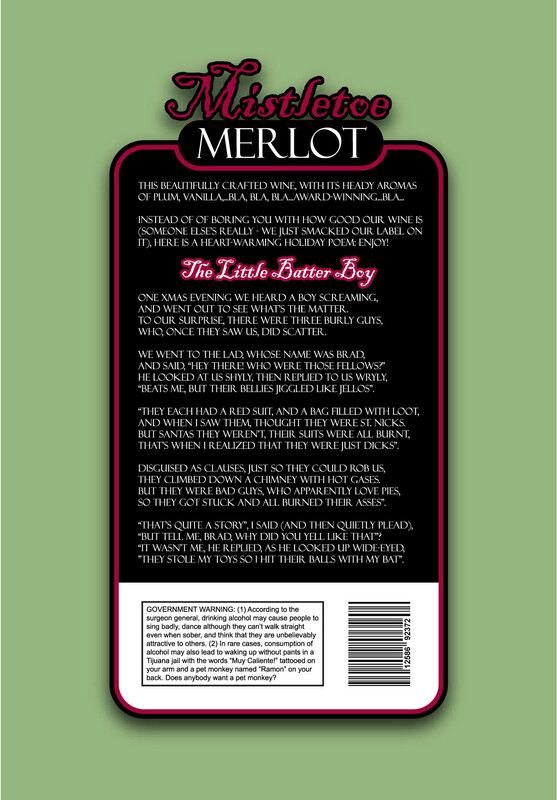 Because wine has both a front and a back label, I decided to write a poem for the reverse side. IT), HERE IS A HEART-WARMING HOLIDAY POEM: ENJOY! AND WENT OUT TO SEE WHAT’S THE MATTER. WHO, ONCE THEY SAW US, DID SCATTER. AND SAID, “HEY THERE! WHO WERE THOSE FELLOWS”? “BEATS ME, BUT THEIR BELLIES JIGGLED LIKE JELLOS”. AND WHEN I SAW THEM, THOUGHT THEY WERE ST. NICKS. THAT’S WHEN I REALIZED THAT THEY WERE JUST DICKS”. THEY CLIMBED DOWN A CHIMNEY WITH HOT GASSES. SO THEY GOT STUCK AND ALL BURNED THEIR ASSES”. “BUT TELL ME, BRAD, WHY DID YOU YELL LIKE THAT”? “THEY STOLE MY TOYS SO I HIT THEIR BALLS WITH MY BAT”. Sadly, Ramon is no longer available for adoption as we have grown to love him. You will have to drink enough so that you acquire your own monkey. Unfortunately, Tijuana is a very long flight from Germany, so you will have to drink quite a lot so that you remain passed-out during the whole flight. Luckily for you, the newly renamed “Geren Winery” is always open.